Description: No idea where, Dalton maybe??? Help! 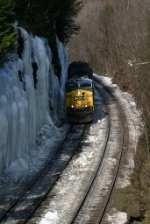 Description: Q116 brakes downgrade through the Twin ledges at MP 131.5 on the CSX Boston Line. Description: SB approaching Airport Blvd. Description: SB at Airport Blvd. Description: Light engine movement with CSX locos 5004,610 and 615 in the line up. Description: 5004 leads Q426 (SEAY) eastbound at Lower Valley Rd. Description: Q426 (SEAY), eastbound at CP 135. Description: 5004 westbound with Q427 (AYSE) in Russell. Will cross over the Russell detector in a moment. Description: Former CR unit still earning its keep! Description: Luckily, the SEPTA won! Description: Q425 westbound at MP 126.